Tammy and I took a trip to see Benjamin this week. You might hear me refer to Benjamin as my cousin sometimes, though we are not actually related. He and my cousin David’s wife, Caryn were friends in college and he’s been a friend of the family ever since. Anyhow, all that to say, I went to see my cousin Benjamin this week in Jinhua. 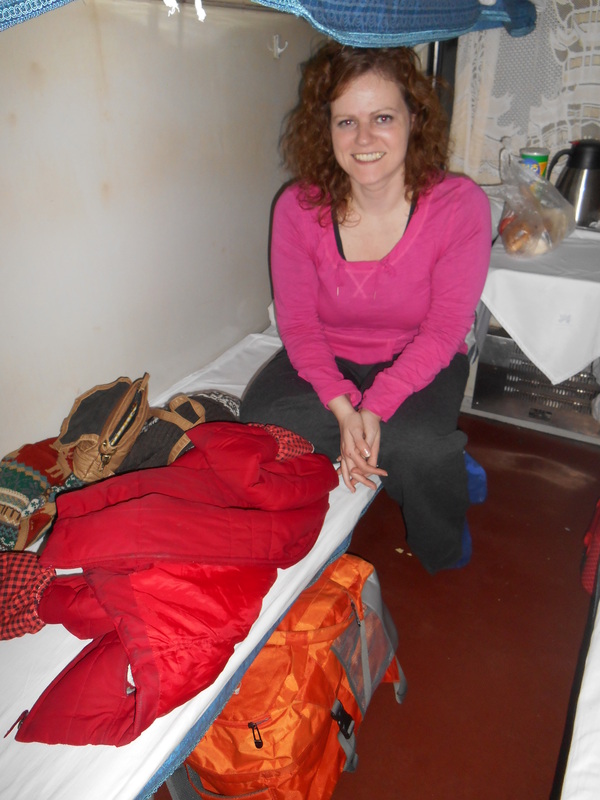 It’s about a 10 hour train ride, so we took the sleeper train. Ours left the station around 10pm and arrived around 5am the next day. The conductor comes around and wakes you up so you don’t miss your stop. It was pretty cool. This is my bunk, the bottom one. They stack three high, and Tammy had to climb to the top bunk. We did some pretty cool stuff in Jinhua. Benjamin and his friends Kevin and May took us to the hot springs and it was the most bizzare experience because I could see my breath in the chilly December day but was still getting so overheated in the steaming hot water that I had to sit out on a rock for a while to cool off. 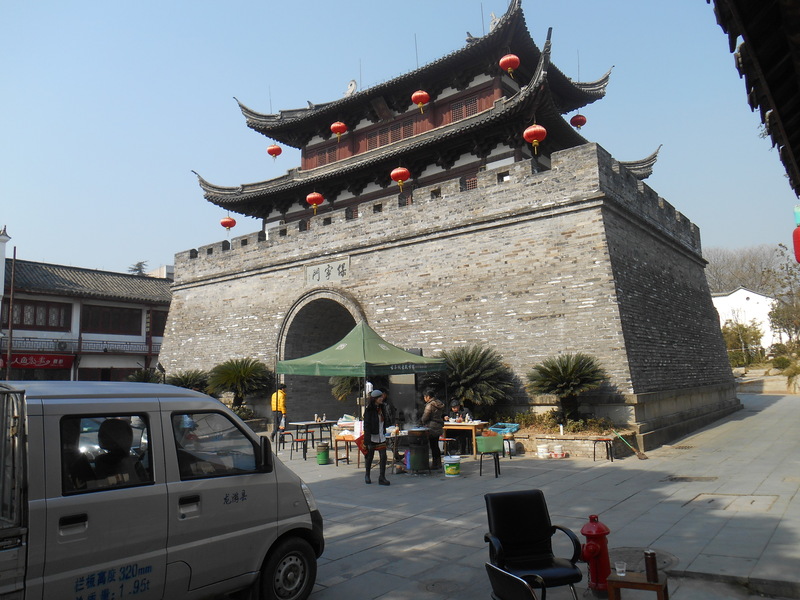 We got to see some of the historic sights around town and I found a tea set at a street market that was really cool. I had to haggle with the lady for a price I thought was fair, but in the end I got a pretty good deal on it. One of Benjamin’s students took us out for dinner, and ordered the dishes for us. Before anyone knew what was going on the plate of chicken feet appeared on our table. 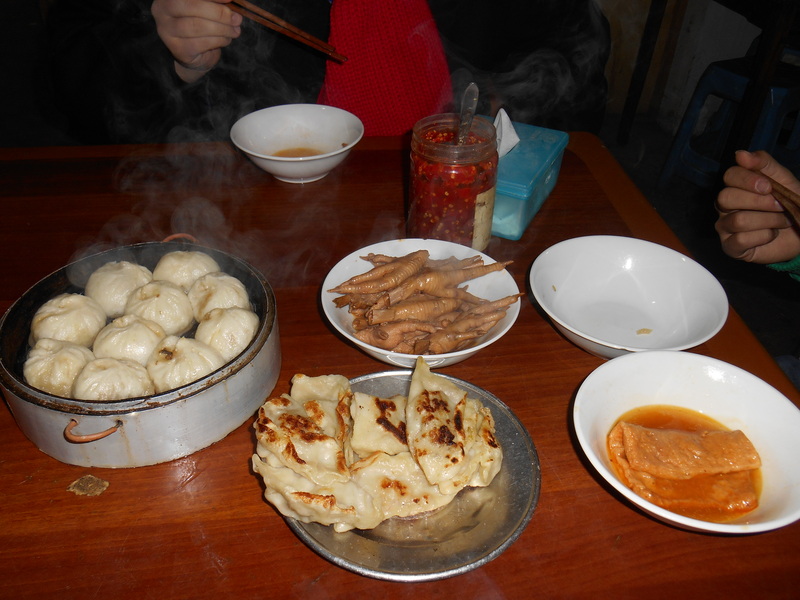 I politely told our host that chicken feet were not my favorite, and that the dish was especially for him. He was thrilled by that and showed us how to eat them. You stick the whole thing in your mouth and eventually spit out the bones and finger nails. Yum. One of the highlights of the weekend was letting off a Chinese lantern. 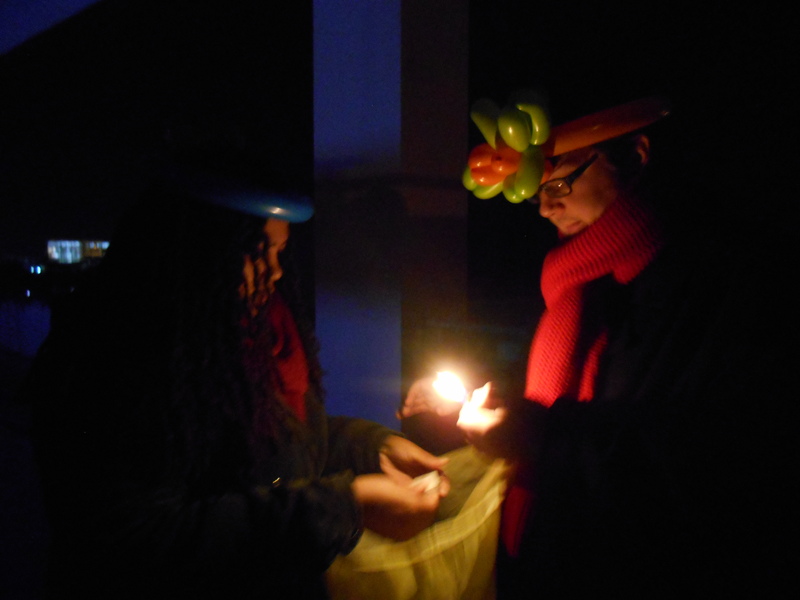 We wrote all our wishes for the new year and climbed up to the roof of Benjamin’s building wearing our balloon animal hats and watched it sail gracefully away. It was pretty awesome. Also for Christmas this year I was able to celebrate with all my best friends here in Wuhan. 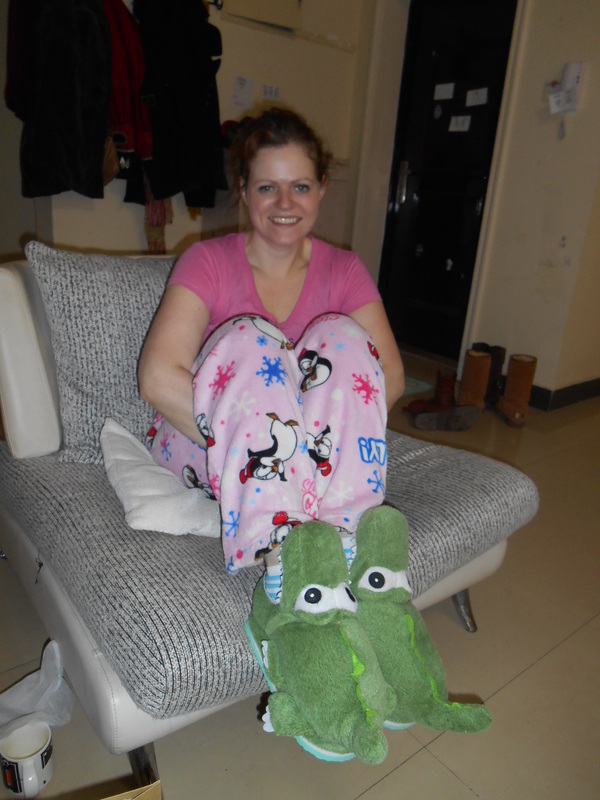 Jim, Kaila and Tammy spent the night and I woke up to these fabulous Alligator Slippers. Aren’t they amazing! 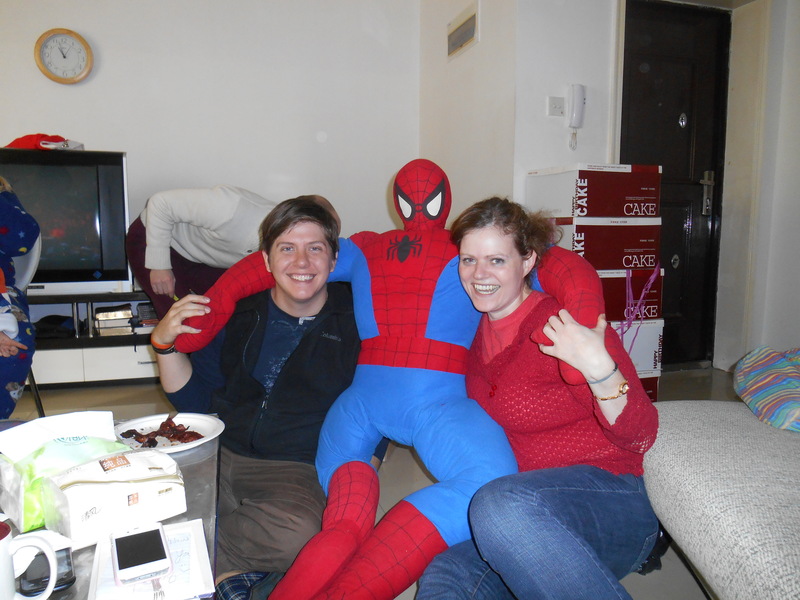 The other gift was a white elephant exchange where we fought over who would win the life size Spiderman doll… Angela was rooting for me to get him, since I need a good man. LOL.